The process you use for adding preservations into Broker Brain for Fannie Mae properties will depend on whether you wish to group your preservations together or maintain them separately. If you maintain your preservations separately, you will need to create each preservation, then within each preservation you will generate any needed forms and vendor bids. If you have multiple vendors bidding on a preservation, the Brokers Scope of Repairs form is a useful tool for creating your vendor bids; you simply generate the form, select the bidding vendors, then elect to save the form and create the bids with a single click. (See bottom of screen for links to this information within the Help Documentation). If you have multiple preservations, you may wish to manage them within a group. The Brokers Scope of Repairs form is an even more useful tool in this scenario. Here, you first create a group, then you generate the Brokers Scope of Repairs form without creating any preservations within the group. From the Brokers Scope of Repairs form, you then indicate which repairs are needed and which vendors are bidding on those repairs. Once the form is complete, you elect to save the form and create your preservations. 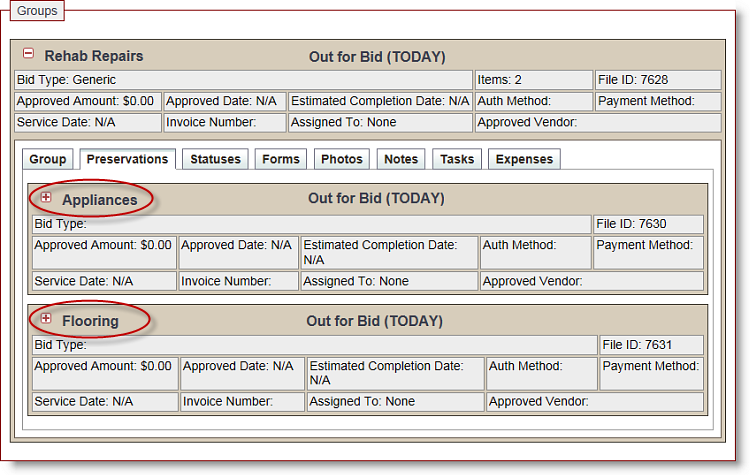 This single click does three things: 1) Creates a preservation for each section in which you added preservation information on the Brokers Scope of Repairs (see screen shot below), 2) Generates a vendor bid for each vendor listed on the form, and 3) Creates a Brokers Scope of Repairs form for each bidding vendor. To create a Group, click here. To add multiple bidding vendors to a preservation using the Brokers Scope of Repairs form, click here. Click here for information on using the Brokers Scope of Repairs form to generate preservations, vendor bids, and vendor BSORs within a group.